"3LA1, V-117" by Timothy K. Perttula and Robert Z. Selden Jr.
DECORATION: The rim is divided into four rectangular panels by vertical appliqued fillets; each panel is filled with opposed incised lines. The vessel body is divided into four semi-circular zones by appliqued fillets; at the center of each zone is a appliqued node covered with small punctations. Each zone also has circular and curvilinear brushing marks. 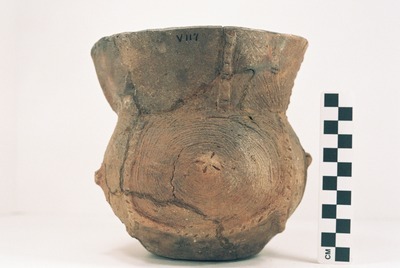 Haley Complicated Incised jar (5425-742).